Platte County seniors Alec Rodgers, left, and Rylie Collins speak to the crowd at the opening ceremony Thursday, March 10 for the Missouri Association of Student Councils annual convention held last week at Platte County High School. More than 1,000 attended the event with Rodgers and Collins serving as convention chairpersons for Platte County, this year’s president school. Students from across the state crowded around the doors of the north gymnasium at Platte County High School, a palpable sense of anticipation filling the lobby. Eventually, the chant, “Let us in,” started, and the throng even briefly supported one ardent attendee of the Missouri Association of Student Councils state convention for a little crowd surfing. More than 1,100 people representing 160 schools were in Platte City for the annual event last week, temporarily morphing Platte County High School into a Willy Wonka-themed leadership center. The opening ceremony provided a chance for Platte County students and faculty to show off the product of a year’s worth of work since being named the president school at last year’s convention. The MASC convention came to Platte County for a second straight year after Park Hill South hosted in 2015. Platte County veteran student council advisors Puckett (16 years) and Kyle Perkins (13 years) worked with about 40 students to help plan and organize the event, which was held from Thursday, March 10 to Saturday, March 12. The majority of the work occurred in the past three months but planning started over the summer with the theme “Leadership is Sweet” chosen this past fall. Timberland High School served as first vice president, Mexico Middle School was second vice president and Chillicothe High School was the state secretary. The majority of Platte County students involved had no experience with the MASC convention nor its setup. Platte County seniors Rylie Collins (student body president) and Alec Rodgers served as convention chairs, while committee members included Caitlyn Cregan, Mallory Stoner, Koryne Matthews, Hayli Tongate, Payton Anderson, Kimberlee Dungan, Rosie Garcia, Lauren Woodhead, Alex Morgan, Taryn Firkins, Kaelyn Knox, Marissa Iden, Molly Duggan, Bailey Harris, Lexie Heise, Ashley Soto, Shairry Lene, Yusef Asefi, Heather Timmons, Hunter Bowen, Harper Sinclair, Kailyn Saxer-Taulbee, Kenedy Knox and Spencer Ruwe. All worked with advisors to organize housing with about 160 host families, meals, programming and, of course, decorations. 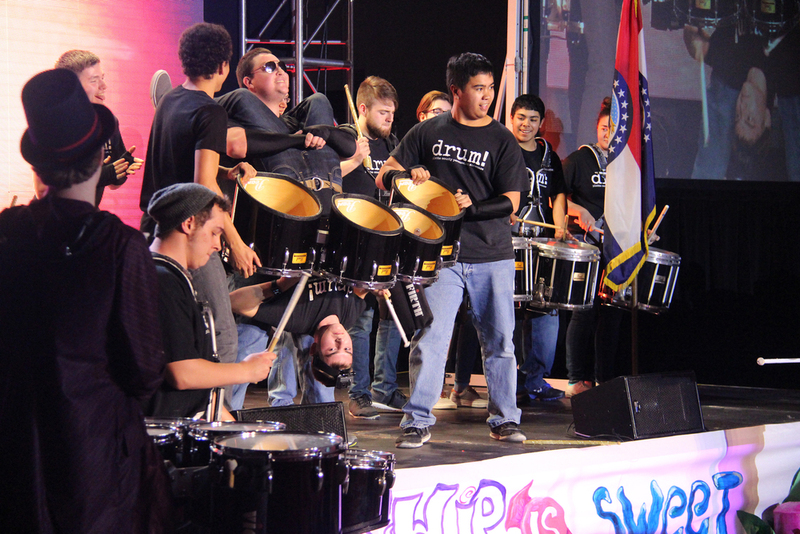 Members of Platte County’s drum line, including from left to right Brady Burress, John Morrione, Michael Sears, Adrian Langley, Nathan Itao, Cade McGinness, Dalton Grenier, Christian Estella, Zoe Bedrosian, Pedro Garcia and Peyton Itao performed during the opening ceremony of the Missouri Association of Student Councils annual convention held last week at Platte County High School. Nathan Itao was holding McGinness, a sophomore, upside down for a short portion of the performance, drawing wild applause from the more than 1,000 students and advisors in attendance. The opening ceremony occurred in a darkened gym with Paradise Productions of Kansas City, Mo. providing lights, large screen displays and music. Collins and Rodgers served as emcees, taking the stage after a loud countdown to the beginning of a show that included two keynote speakers, a special presentation to custodian Kelli Buckler (more on that in another story in this week’s issue) and a performance from the Platte County Drum Line that featured sophomore Cade McGinness playing while being held upside down by another member of the band. The rapt crowd at the opening ceremony stayed attentive through the hour-plus presentation, including a lengthy speech from Mike Smith — a well-known motivational speaker who encourages students about taking action while they ask themselves what they want to be remembered for. He closed out the evening with a group selfie, upping the world record he owns for selfies with the most people. From there, the first evening ended, but the second day included a day full of sessions for students along with a special presentation involving regional members of the Special Olympics. On Saturday, early sessions were held before allowing the travelers to depart back home after a short but meaningful experience. Perkins continued to monitor comments about the event on social media this week and felt good about how Platte County handled such a difficult task after being elected president school last March. “We’ve never done something this big,” Collins said. “Walking down the hall, it was so cool to have administrators tell me, ‘This is amazing. We are so proud of you guys.’ A lot of things go unsaid for stuco. A lot of people don’t give as much credit for what we do for our school. Motivational speaker Mike Smith, center, took a moment for a mass group selfie after he delivered the keynote speech during the opening ceremony of the Missouri Association of Student Councils annual convention held last week at Platte County High School. A native of Imperial, Neb., Smith is known for encouraging groups not to be concerned with what they’ve done but what they are doing and what legacy they plan to leave for those who knew them.